Bulbs 2-5+, clustered, often short-rhizomatous at base, rhizome not stout or iris-like, oblong, elongate, 1-3 × 0.8-1.5 cm; outer coats enclosing 1 or more bulbs, grayish or brownish, membranous, minutely striate, cells in regular vertical rows, narrowly elongate, fibers persistent, parallel, few; inner coats white to pink or reddish, cells in regular vertical rows, narrowly elongate. Leaves persistent, green at anthesis, 3-5, basally sheathing, sheaths not extending much above soil level; blade solid, flat, channeled to broadly V-shaped in cross section, 10-25 cm × 1-6 mm, margins entire or denticulate. Scape persistent, sometimes 2 or more produced successively from single bulb, usually clustered, nodding, solid, terete or ridged, particularly distally, sometimes flattened and narrowly winged, abruptly recurved near apex, 10-50 cm × 1-3 mm. Umbel persistent, cernuous, loose, 8-35-flowered, hemispheric, bulbils unknown; spathe bracts persistent, 2, 3-veined, lanceolate, ± equal, apex acuminate, beakless. Flowers campanulate, 4-6 mm; tepals ± erect, pink or white, elliptic-ovate, ± equal, withering in fruit, margins ± entire, apex ± obtuse, at least outer tepals strongly incurved, midribs not thickened; stamens exserted; anthers yellow; pollen yellow; ovary conspicuously crested; processes 6, flattened, ± triangular, margins entire or toothed; style exserted, linear, ± equaling stamens; stigma capitate, scarcely thickened, unlobed; pedicel 6-25 mm, becoming stouter in fruit, elongating and bending abruptly upward from near point of attachment. Seed coat dull or shining; cells smooth, minutely roughened, or each with minute, central papilla. 2n = 14. Flowering Jul--Oct. Widely distributed on moist soils in mountainous and cool regions; 600--3500 m; Alta., B.C., Ont., Sask. ; Ala., Ariz., Ark., Colo., D.C., Ga., Idaho, Ill., Ind., Iowa, Ky., Md., Mich., Minn., Mo., Mont., Nebr., N.Mex., N.Y., N.C., Ohio, Oreg., Pa., S.C., S.Dak., Tenn., Tex., Utah, Va., Wash., W.Va., Wis., Wyo. ; Mexico. Allium cernuum is the most widespread North American species of the genus. 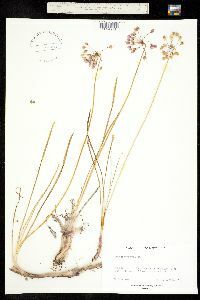 It is closely related to A. stellatum, and the character commonly used to differentiate them has been umbel orientation. In both species, the inflorescence is nodding in bud, but in A. stellatum it usually becomes erect by anthesis. In A. cernuum the peduncle remains permanently recurved near the apex, although the inflorescence may sometimes become erect overall, or nearly so. While this character is helpful in identification, an almost exclusive reliance on it (even by one of the present authors in his youth) has obscured other clearer distinctions between the species and has confused their geographic ranges. More reliable characters for differentiating these species are bulb shape (elongate in A. cernuum, ovoid in A. stellatum) and perianth shape (campanulate in A. cernuum, stellate in A. stellatum). 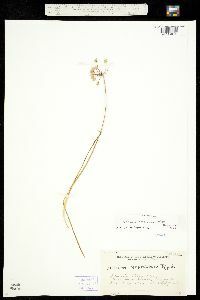 Unfortunately, perianth shape is often difficult to see in herbarium specimens. Perennial herb with two to five or more bulbs flowering stem 30 cm - 0.6 m tall Leaves: three to five, arising near the base, shorter than stem, 10 - 45 cm long, 2 - 8 mm wide, flat, linear, soft, sometimes small-toothed. Inflorescence: a nodding, dome-shaped umbel of eight to thirty-five flowers raised on a single narrow stalk and subtended by two lance-shaped, persistent bracts. Flowers: on 12 - 25 mm long stalks, white to pink to rose-colored, 4 - 6 mm long, bell-shaped, with six tepals that wither in fruit. Stamens six, exserted. Anthers yellow. Fruit: a short, three-lobed capsule. Bulbs: clustered, up to 3 cm tall, slender, conic, gradually tapering into the stem, and encased in a brownish or grayish membranous coating. 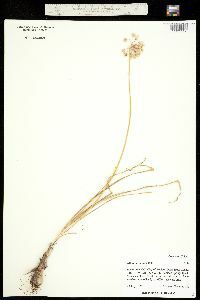 Similar species: Allium stellatum is similar but has stiff leaves and an upright, not nodding, umbel during full flower. However, since the umbel can sometimes be nodding, it is a good idea to compare bulb and flower shape as well. Habitat and ecology: Frequent in remnants of prairies. Also found along railroads and in open woods. 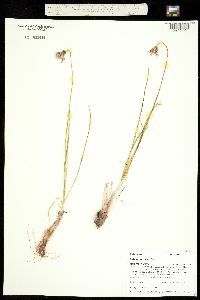 Notes: Allium cernuum is the most widespread species of the genus in North America. Etymology: Allium comes from the Latin word for garlic. Cernuum means nodding. Infrequent throughout the state although there are no records from the southwestern counties. Where it is found, especially on the banks of streams, it is genrally common except in marshes and springy places. This species has a wide range of habitat and distribution. 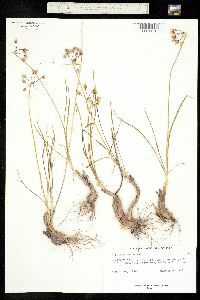 It is usually found on the high and dry banks of streams but it is also found in low, sedge marshes, in marly springy places, and on gravelly bars in rivers. The color of the flowers ranges from white to deep pink. The white form has been named and I have it from Wabash County.